Geek Out V2 is a compact DAC and headphone amplifier that connects to your computer or mobile device through a USB port. It supports full-resolution audio so you can feel closer to your music, no matter the format. About 25 times more powerful than a laptop or phone's output jack, Geek Out V2 can drive any set of headphones. Geek Out V2 is small and lightweight so you can take it anywhere you go, but don't let its diminutive size fool you. It's a boss. Geek Out V2 is the most transparent DAC you can find, supporting PCM up to 32/384 kHz and DSD up to 128 times the sample rate of a CD. GEEK OUT V2 IS A PROBLEM SOLVER. Geek Out V2 lets you choose between Time Coherence Mode (minimum phase) or Frequency Response Mode (slow roll-off linear). It's the only portable DAC that gives you this much control. 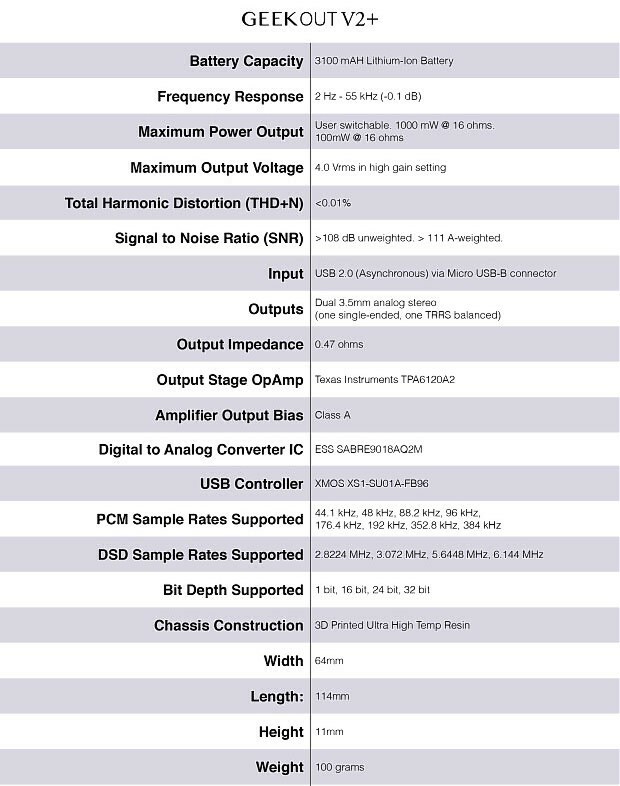 Geek Out V2 fully complies with the USB 2.0 Audio Specification. That means it's plug-and-play on USB 2.0 devices. We provide a driver for non-compliant operating systems. Not all headphones are created equal, so Geek Out V2 lets you choose how much power to output: 100 mW for sensitive IEM's or 1000 mW for large cans. GEEK OUT V2+ IS THE MASTER OF ADAPTABILITY. Geek Out V2+ takes the cutting-edge tech of V2 and adds a huge 3100 mAh lithium ion battery, giving you noise-free playback for up to 10 hours. With its added portability, Geek Out V2+ is designed to connect to your computer and your Android or iOS device. 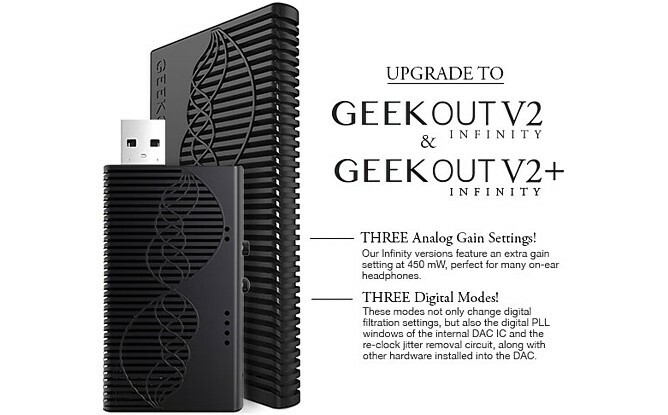 Geek Out V2 and V2+ are designed with the same principle in mind that we used when we first introduced our original Geek Out, it has to play real 32 bit / 384 kHz PCM audio and DSD128 natively. That means, it can play any music file format. Geek Out V2 and V2+ are designed to give you the most accurate, real to life, playback of your favorite music. Thanks to their high-resolution capabilities, noise-free background and increased amplification, your music is effortlessly placed on a true to life, three dimensional soundstage. They're unlike any other portable headphone device out there. So go ahead, take your soundstage with you anywhere you go. Ever wish you could turn up the volume on your music just a little more? Well, Geek Out V2 and V2+'s amplifier is up to 25 times more powerful than the headphone amplifier typically used in audio devices. That means you can really crank this sucker up. Not only is it louder, it's clearer and has dramatically more detail and bass. 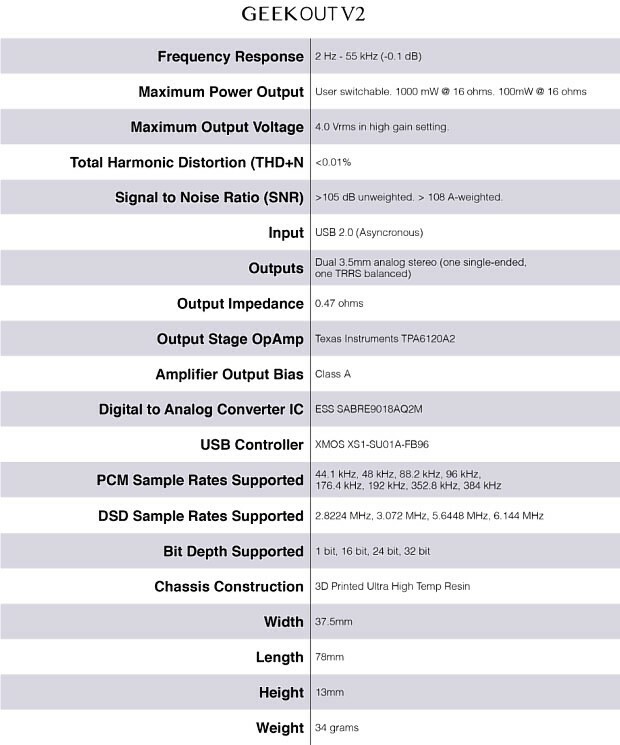 Geek Out V2 and V2+ aren't just a couple of powerful audio devices, they're also very high resolution ones. That means they can reproduce even the tiniest details in your music, making the experience of listening to music more like real life. One secret of great digital audio is a lack of digital noise. Geek Out V2 and V2+ don't let noise get into the signal thanks to their regulated bipolar power supplies and extremely accurate dual clocks. The end result is real-to-life vocals and amazingly accurate instrument separation. Just because Geek Out V2 and V2+ can scream at the top of its lungs doesn't mean it's not sensitive enough to whisper into you in-ear-monitors. Adjustable gain settings allow you to perfectly match the output power for your HUGE power hungry cans or uber sensitive IEM's.